For quite some time Vega has been one of the few companies to make a plant-based, natural, dare-we-say ‘healthy’ pre workout. That product has been Vega Sport Energizer, and a lot of you loved it a lot. However years later, we are here to once again review Sport Energizer pre workout because the formula has indeed changed. Not just a small tweak either, we’re talking an entire shift from active ingredients to the way the product tastes. What sparked the Vega pre workout formula to change? Honestly we’re not sure. While the founders (Brendan Brazier and Charles Chang) are still attributed to the company, they sold Vega back in 2015 (1)(2)(3). Now, Vega is likely apart of a bigger picture in WhiteWave’s portfolio containing companies like Silk coconut milk, Horizon dairy, and many more exceptional brands. Vega Sport Energizer Vs Old Formula: what’s different? Coconut oil powder: energy rich source of medium chain triglycerides. Yerba mate: natural and nootropic-rich source of caffeine. Devil’s claw: a strong anti-inflammatory that may aid weight loss. Green tea: likely a second caffeine source. Rhodiola: a powerful adaptogen used to improve mood and endurance. Gingseng: natural source of energy. Turmeric: aids nitric oxide production and is a strong anti-inflammatory. Ginger: likely improves the uptake of ingredients listed above. Considering that the only other plant-based energy sources for exercise were coffee and tea at the time, its easy to see how the old Vega Sport Energizer formula was a hit. Coffee berry extract: for 89 milligrams caffeine. Green tea extract: 11 milligrams caffeine. Well, besides the 15 grams of added sugar (but in their defense, the previous version contained 13)! Bottom line: The Vega Sport Energizer formula has been drastically cut. But perhaps the new ‘premium version’ can save the day? Eleuthero root: more commonly known as siberian ginseng, eleuthero root is an adaptogen that reduces bodily stress and may increase endurance. Rhodiola: an extremely popular adaptogen commonly utilized for stress-reduction, hormone balance, and increased athletic performance. Rhodiola was included in the old Vega Sport Energizer formula. 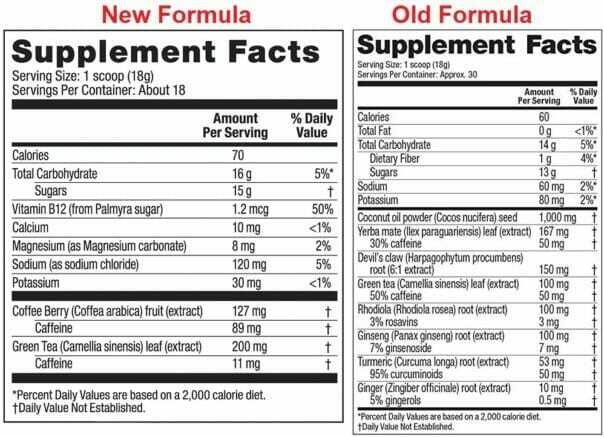 Besides these two additions, the premium formula is nearly identical to the standard. Between the two, the premium formula is better due to the eleuthero… But its a close competition and you will be paying more. As you would expect, the sugar-free version is simply Sport Energizer without sugar. However, what you likely didn’t expect, is that its actually the Premium version without sugar… That means, eleuthero and rhodiola is included. Bottom line: Both the premium and sugar-free versions of Vega Sport Energizer contain the addition of eleuthero and rhodiola. This makes them the better option in comparison to the standard version. A few months back we reviewed Vega’s nearest plant-based pre workout competitor – Garden of Life Sport Energy + Focus. For starters, these two formulas are quite comparable. Where Vega is more direct with the formulation, Garden of Life includes their 11 grams of added sugar into the ‘organic antioxidant energy blend’… Leading you to think that there is a significant amount of greens in there, when really there isn’t. Once you cut through all the labeling confusion and test the pre workouts, you’ll find that Vega Sport Energizer’s standard formulation is nearly the same in effect to Garden of Life’s Energy + Focus. On the flip side, Vega’s ‘premium’ and ‘sugar-free’ pre workout variants prove themselves superior. Bottom line: While both brands advertise completely different labels, the same basic ‘functional formulas’ are present… Caffeine. Overall, Vega Sport Energizer Premium and Sugar-Free are superior. If you live an exceptionally green lifestyle that is mostly void of caffeine, then you will get quite a kick out of Vega Sport Energizer. However if you are used to taking pre workouts, drinking coffee, etc – but would like to try a ‘plant-based’ alternative to be healthier… This really is not going to give you the type of energy and performance experience that you are hoping for. Simply does not compare. Have you tried any of the pant-based pre workouts discussed above? Share your feedback below.